The combination of hyperoxaluria and hypocitraturia can trigger Ca2+-oxalate stone formation, even in the absence of hypercalciuria, but the molecular mechanisms that control urinary oxalate and citrate levels are not understood completely. Here, we examined the relationship between the oxalate transporter SLC26A6 and the citrate transporter NaDC-1 in citrate and oxalate homeostasis. Compared with wild-type mice, Slc26a6-null mice exhibited increased renal and intestinal sodium-dependent succinate uptake, as well as urinary hyperoxaluria and hypocitraturia, but no change in urinary pH, indicating enhanced transport activity of NaDC-1. When co-expressed in Xenopus oocytes, NaDC-1 enhanced Slc26a6 transport activity. In contrast, Slc26a6 inhibited NaDC-1 transport activity in an activity dependent manner to restricted tubular citrate absorption. Biochemical and physiologic analysis revealed that the STAS domain of Slc26a6 and the first intracellular loop of NaDC-1 mediated both the physical and functional interactions of these transporters. These findings reveal a molecular pathway that senses and tightly regulates oxalate and citrate levels and may control Ca2+-oxalate stone formation. At a pH of 7.4, citrate is mostly in the form of a tricarboxylic acid, but it can be reabsorbed only by the proximal tubule epithelium in its divalent form.16 The luminal pH at the proximal tubule drops from 7.4 to 6.5,17 which favors the divalent form of citrate and thereby allows citrate transport. In mammals, the major luminal citrate transporter in both the intestine and proximal tubule is the Na+-dependent dicarboxylate co-transporter, NaDC-1 (NCBI accession no. AY186579).18 NaDC-1 (Slc13a2), the second member of the SLC13 family, has 11 transmembrane domains, with cytoplasmic N- and extracellular C-termini.18 In light of the importance of the citrate/oxalate balance in regulating free Ca2+ in bodily fluids, we hypothesized that citrate/oxalate balance may be regulated by a molecular mechanism that fine-tunes citrate and oxalate concentrations. Such a mechanism should involve the two major transporters, slc26a6 and NaDC-1. In the present work, we report on a new pathway that involves interplay between slc26a6 and NaDC-1 that determines citrate/oxalate homeostasis. The pathway involves the mutual but reciprocal regulation of slc26a6 (activation) and NaDC-1 (inhibition). The interaction between the oxalate and citrate transporters is mediated by the slc26a6 STAS domain and the NaDC-1 first intracellular loop (ICL1), which recapitulate the function of the full-length transporters. These findings reveal a molecular pathway that tightly regulates oxalate and citrate to guard against Ca2+-oxalate stone formation. Deletion of slc26a6 in mice upregulates Na+-dependent dicarboxylate uptake. (A–C) Analysis of urine cittrate (A), oxalate (B), and pH (C) in wild-type and slc26a6−/− mice collected during 3 consecutive days. Notice the significant decreased citrate and increased oxalate with minimal change in urinary pH in slc26a6−/− mice urine. (D) Na+-dependent succinate uptake by kidney slices obtained from wild-type and slc26a6−/− mice. Urinary citrate is determined by proximal tubule citrate absorption, which is mediated by Na+-dicarboxylate co-transporter NaDC-1.20 Reduced urinary citrate suggests increased citrate absorption and NaDC-1 activity in the slc26a6−/− mice. In preliminary experiments, the signal-to-noise ratio of Na+-dependent succinate transport in renal brush-border membranes preparation from mice kidney was too small to resolve the effect of slc26a6 on the transport. Therefore, we prepared kidney cortical slices (see Concise Methods section). Figure 1D shows that deletion of slc26a6 increased the Na+-dependent succinate uptake by about 70%. A limitation of the slice preparation is that altered succinate uptake could not be assigned to the luminal membrane. However, because slc26a6 is expressed in the luminal membrane, the increase most likely reflects increased activity of NaDC-1. Since slc26a6 and NaDC-1 are expressed at a high level in the jejunum,16,21,22 and slc26a6-mediated jejunal oxalate excretion has a major role in controlling systemic oxalate metabolism,4 we also used jejuna sheets from slc26a6−/− and WT mice and measured the Na+-dependent succinate uptake. Supplemental Figure 1, A and B, shows that deletion of slc26a6 had no effect on the Na+-independent succinate uptake while increasing the Na+-dependent uptake by about 35%. This increase reflects an increased native NaDC-1 activity and can account for the reduced urinary citrate in the slc26a6−/− mice. The next question we asked is: If the increased Na+-dependent succinate uptake is mediated by NaDC-1, do slc26a6 and NaDC-1 interact biochemically and functionally? First, we asked whether slc26a6 regulates the activity of NaDC-1. For this, we expressed NaDC-1 and slc26a6 separately or together in Xenopus oocytes and monitored NaDC-1 activity as Na+-dependent succinate current at a pH of 7.5.20 Under these conditions, succinate has one negative charge and coupling to 3Na+ generated the expected inward current. Figure 2, A and B, shows that slc26a6 markedly inhibits the activity of NaDC-1. The control experiments in Supplemental Figure 2 show that slc26a6 does not transport succinate and NaDC-1 does not transport oxalate. Importantly, Figure 2C shows that surface expression of NaDC-1 is not affected by coexpression with slc26a6, indicating that slc26a6 regulates transport by NaDC-1. On the other hand, slc26a6 and NaDC-1 can be readily co-immunoprecipitated (see Figure 2D and discussion below). Finally, inhibition of NaDC-1 was not restricted to slc26a6 because the 2Cl-/1HCO3− exchanger slc26a36,7 similarly inhibited NaDC-1 activity (Figure 2B), although the SO42−/OH−/Cl− exchanger slc26a223 did not (Supplemental Figure 3). NaDC-1 mediated Na+-succinate cotransport is inhibited by slc26a6. (A) Representative traces. (B) Summary of the current mediated by NaDC-1-dependent Na+-succinate cotransport in oocytes expressing NaDC-1 alone (black) or coexpressed with slc26a6 (gray) or slc26a3 (light gray). The transport was initiated by the addition of 1 mM succinate to the perfusate, as indicated. (C) Surface expression of NaDC-1(Flag) in the presence and absence of slc26a6. Note that the coexpression with slc26a6 has no effect on surface NaDC-1. (D) Reciprocal Co-IP of NaDC-1(Flag) and slc26a6(GFP). Expression in HEK cells was used for surface expression and Co-IP. An important question is whether NaDC-1 senses the activity of slc26a6: namely, whether the inhibition is more significant when slc26a6 is active. To address this question we compared the inhibition of NaDC-1 by active slc26a6 and by the inactive slc26a6(E357K) mutant, which lacks all forms of slc26a6 activity.7 Interestingly, Figure 3 shows that although both active and inactive slc26a6 inhibit NaDC-1, active slc26a6 inhibited NaDC-1 about two-fold more than did inactive slc26a6(E357K). These findings indicate that once interacting, slc26a6 inhibits NaDC-1, but when slc26a6 is active it may resume a conformation that enhances interaction with NaDC-1. This may function as a sensing mechanism whereby inhibition of NaDC-1 becomes more effective when oxalate excretion takes place. 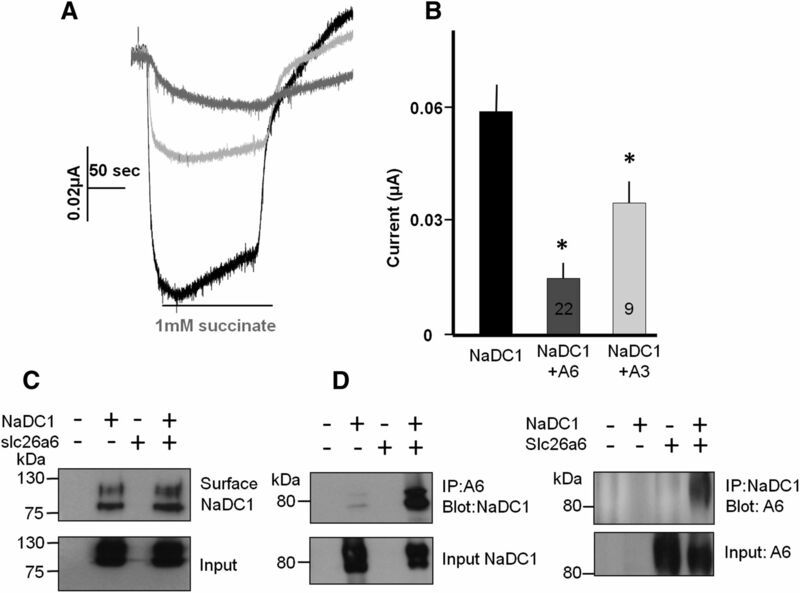 Transport competent slc26a6 enhances inhibition of NaDC-1. (A) Representative traces. (B) Summary of NaDC-1 current when expressed alone or together with slc26a6 or the inactive slc26a6(E357K) mutant. Inhibition of NaDC-1 by slc26a6 raised the question of whether NaDC-1 reciprocally affects the activity of slc26a6. In Figure 4, A and B, we measured the effect of NaDC-1 on slc26a6-mediated Cl−/oxalate exchange in oocytes expressing slc26a6 alone or coexpressing slc26a6 and NaDC-1. 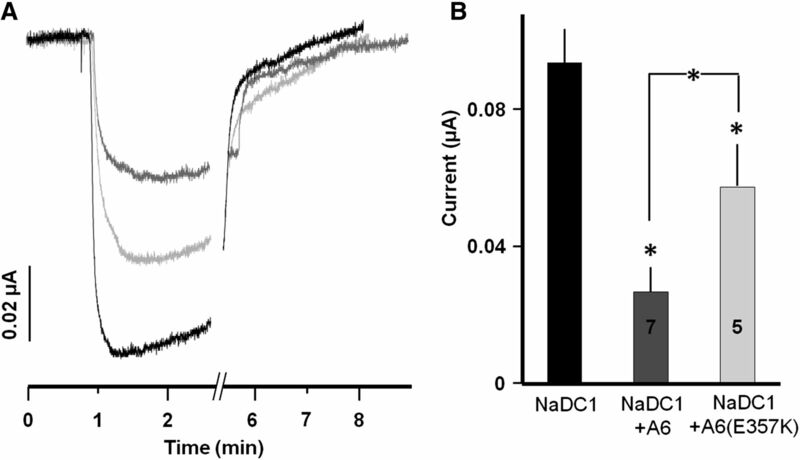 NaDC-1 does not transport oxalate (Supplemental Figure 2). Addition of 1 mM oxalate to oocytes bathed in Cl−-free solution resulted in an outward current due to Cl−/oxalate exchange.7 The slow reduction in the current is due to accumulation of intracellular oxalate, which accounts for the overshoot in the inward current upon readdition of Cl−. Coexpression of NaDC-1 increased Cl-/oxalate exchange by about 30% (Figure 4B). Another important function mediated by slc26a6 is 1Cl−/2HCO3− exchange. Figure 4, C and D, shows that NaDC-1 similarly increased the slc26a6-mediated 1Cl−/2HCO3− exchange without affecting the stoichiometry of the exchange. This may function to increase the pH at the NaDC-1/slc26a6 microdomain to limit access of divalent citrate to NaDC-1. Figure 4E shows that surface expression of slc26a6 is not increased by NaDC-1, indicating that NaDC-1 regulates slc26a6 activity rather than trafficking. The results in Figures 2–4 were obtained with opossum NaDC-1 that was used originally to characterize NaDC-1.18 Supplemental Figure 4 shows that similar results were obtained with human NaDC-1 (NCBI accession no. BC096277). Taken together, the results in Figures 1–4 indicate that NaDC-1 and slc26a6 interact and reciprocally regulate their activities; NaDC-1 activates slc26a6 while slc26a6 inhibits NaDC-1, and the inhibition is modulated by the activity of slc26a6. slc26a6-mediated Cl−/oxalate and Cl−/HCO3− exchange is augmented by interaction with NaDC-1. (A) Current was measured in Xenopus oocytes expressing slc26a6 alone or slc26a6 and NaDC-1 to monitor slc26a6 Cl−/oxalate exchange. The oocytes were incubated in Ca2+-free solution and then exposed to 1 mM oxalate, as indicated by the bar. Re-addition of Cl− and removal of oxalate resulted in the expected inward current. The summary (B) is given as mean ± SEM, and the number of observations is listed on the columns. (C) Measurement of slc26a6-mediated Cl−/HCO3− exchange by the simultaneous measurements of [Cl−]i and pHi in oocytes expressing slc26a6 alone or with NaDC-1. (D) Mean ± SEM of 7–9 experiments. (E) Lack of effect of NaDC-1 on surface expression of slc26a6(mKate) expressed in HEK cells. Our next aim was to identify the molecular determinants that mediate the interaction between NaDC-1 and slc26a6. We have previously identified the SLC26 transporter STAS domain as a protein-protein–interacting domain that participates in regulation of other transporters, such as cystic fibrosis transmembrane conductance regulator,24 and therefore tested whether it may mediate the slc26a6-NaDC1 interaction. Figure 5, A and B, shows that both the slc26a6 and slc26a3 STAS domains inhibit NaDC-1 to the same extent measured with the full-length transporters. In addition, the slc26a6 STAS domain and NaDC-1 can be co-immunoprecipitated (Figure 5C). 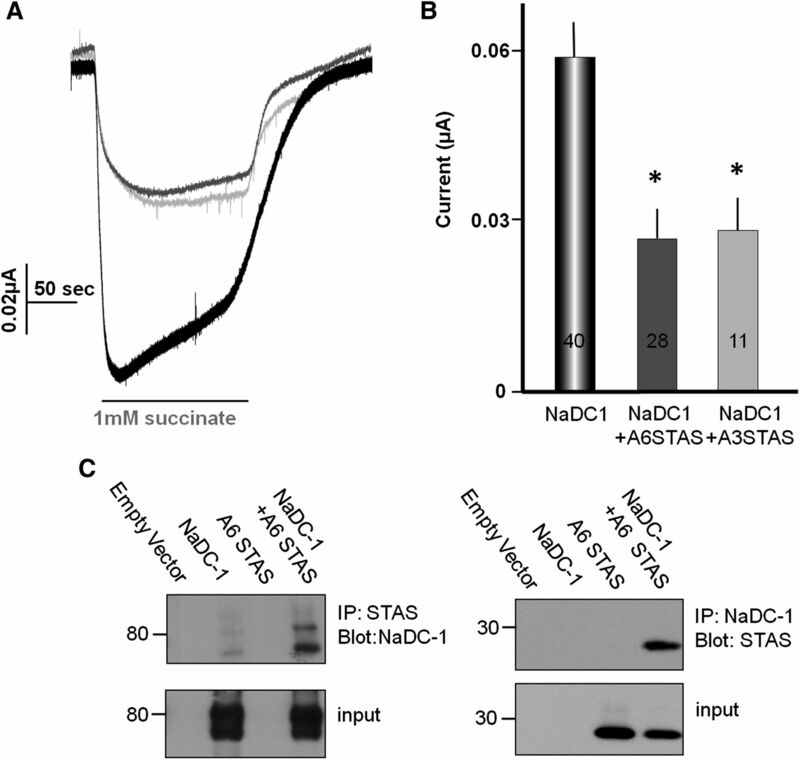 These observations show that slc26a6 inhibits NaDC-1 via STAS domain-mediated interaction. The SLC26 transporters STAS domain mediates NaDC-1 inhibition. (A) Example traces. (B) Mean ± SEM of the indicated number of experiments showing that the slc26a6 (gray) and Slc26a3 (light gray) STAS domains inhibit NaDC-1 activity. (C) Reciprocal co-immunoprecipitation of the slc26a6(myc) STAS domain and NaDC-1(Flag) expressed in HEK cells. To locate the NaDC-1 site that interacts with the STAS domain, we generated the five NaDC-1 fragments illustrated in Figure 6A, based on the 11 transmembrane domain topology model of NaDC-1 (Pajor25 and Supplemental Figure 5). All fragments except NaDC-1-M45× interacted with slc26a6, suggesting that NaDC-1(45–118) that includes the first NaDC-1 ICL1 is probably the slc26a6 interacting site. To ascertain that the lack of interaction of NaDC-1(1–45) and the interaction of NaDC-1(1–118) was not promoted by the mCherry tag, we prepared hemagglutinin-tagged fragments and obtained the same results (Figure 6B). We also prepared NaDC-1 with truncated ICL1 (NaDC-1[ΔICL1]) (Figure 6C). Unfortunately, this construct did not traffic to the plasma membrane, as evident from the presence of only the nonmature form of the protein (Figure 6C). This precluded determination of the effect of the truncation on NaDC-1 activity and co-regulation by slc26a6. Nevertheless, we used this construct to test for interaction with slc26a6, and as shown in Figure 6D, truncation of ICL1 markedly reduced interaction of NaDC-1 with slc26a6. Together, the results in Figure 6 indicate that NaDC-1 ICL1 mediates the interaction with slc26a6. 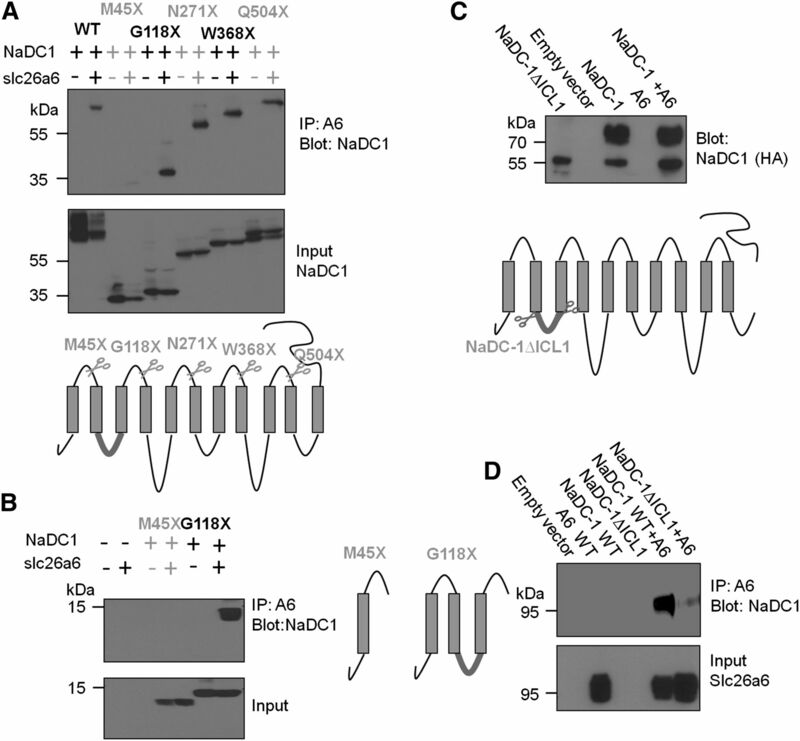 NaDC-1 ICL1 mediates interaction with slc26a6. (A and B) The indicated NaDC-1 truncation constructs (Flag or hemagglutinin-tagged, see illustration) were expressed in HEK cells with or without slc26a6 and were used to test co-immunoprecipitation with slc26a6. M45×, which retains the first 45 residues of NaDC-1, is the only construct that does not interact with slc26a6, providing the first evidence that ICL1 is the interacting site. Although deletion of ICL1 (HA-NaDC-1∆ICL1) results in impaired maturation of NaDC-1 (C), deletion of ICL1 markedly reduces the interaction of NaDC-1 with slc26a6 (D). To further establish the role of ICL1 in the regulation of slc26a6, we prepared a His-tagged ICL1 construct that includes residues 35–119 of NaDC-1 and tested its interaction with and activation of slc26a6. Figure 7, A and B, shows that ICL1 activated slc26a6-mediated Cl−/oxalate exchange to the same extent as NaDC-1. Furthermore, ICL1 interacts with both full-length slc26a6 and the slc26a6-STAS domain (Figure 7C). Hence, the interaction between NaDC-1 and slc26a6 occurs intracellularly and is mediated by the slc26a6 STAS domain and the NaDC-1 ICL1. NaDC-1 ICL1 activates slc26a6 by interaction with the STAS domain. (A) Example current traces. (B) is the mean ± SEM of the indicated number of experiments of slc26a6-mediated Cl−/oxalate exchange activity from Xenopus oocytes expressing slc26a6 alone (black) or slc26a6 and NaDC1-ICL1. (C) Reciprocal co-immunoprecipitation of ICL1(His-myc) with full-length slc26a6 and with the slc26a6 STAS(HA) domain expressed in HEK cells. We describe a molecular mechanism via interaction of two transporters that can set the oxalate/citrate level in several organs that express the oxalate transporter slc26a6 and the citrate transporter NaDC-1, and that experience variable loads of these molecules. Biochemical and functional analyses reveal interaction between slc26a6 and NaDC-1 mediated by specific modules. The STAS domains of several SLC26 transporters—slc26a3, slc26a6, and SLC26A924,26–28—were shown to function as protein-protein–interacting domains to mediate the mutual regulation of the SLC26 transporters and CFTR. The slc26a6 STAS domain also interacts with carbonic anhydrase II.29Here we show that the STAS domains of slc26a6 and slc26a3 interact with NaDC-1 and inhibit NaDC-1 activity, similar to the full-length protein. It is of interest that slc26a3 and slc26a6 but not slc26a2 inhibited the activity of NaDC-1 (Supplemental Figure 3). This may relate to the variability in the STAS domain. The highest variability and the most prominent difference between the STAS domains of the SLC26 transporters is at a defined region referred to as the intervening sequence or variable loop found between the first α-helix and third β-sheet.30 This region is predicted to be disordered in solution and contains many positively charged residues. Slc26a2 lacks the intervening sequence loop. The molecular identity of NaDC-1 has been known for several years.20 Despite the low sequence similarity with mammalian NaDC-1, the bacterial Na+/citrate symporter citS and NaDC-1 share many features. Both proteins are predicted to have 11 transmembrane domain spans, which is supported by experimental data.25,31 This was further established recently by the resolved structure of the bacterial Na+-dicarboxylate transporter VcINDY.32 NaDC-1 and VcINDY also mediate Na+/citrate cotransport. Here we used the 11 transmembrane domain topology of NaDC-1 (Supplemental Figure 5) to identify ICL1 as the NaDC-1 module that interacts with the STAS domain to enhance slc26a6 activity. Significantly, ICL1 is as effective as full-length NaDC-1 in the activation of slc26a6, indicating that STAS-ICL1 domains interaction underlies the molecular mechanism of citrate/oxalate regulation by slc26a6 and NaDC-1. That ICL1 and the STAS domain recapitulate the interaction and mutual regulation of NaDC-1 and slc26a6 indicates that interaction between the transporters is required for the regulation. Indeed, the mutant slc26a6(E357K) that lacks all slc26a6 functional modes7 inhibited NaDC-1. However, slc26a6(E357K) was less effective than slc26a6 in inhibiting NaDC-1, suggesting two levels of regulation of NaDC-1 by slc26a6. The inhibition is mediated by direct interaction between the transporters and is augmented when slc26a6 is engaged in transport. 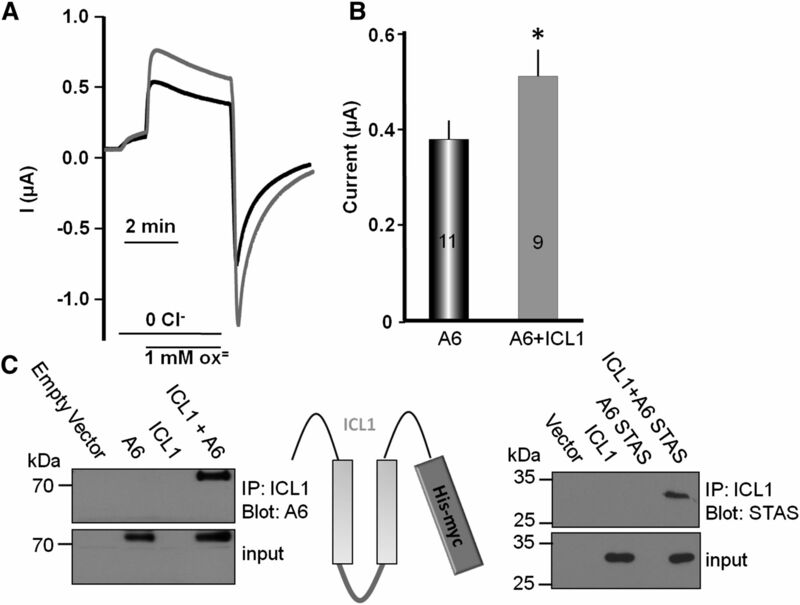 The requirement for an active slc26a6 may reflect favoring of a STAS domain conformation that interacts better with ICL1, sensitivity of NaDC-1 to pH, the membrane potential, or all of the above. Our findings are not sufficient to firmly support any of these possibilities, although sensitivity of NaDC-1 to pH and the membrane potential is well established (see below). The present findings raise the possibility that physiologically NaDC-1 activity is inhibited mostly when slc26a6 is actively transporting oxalate. The mutual and reciprocal regulation of slc26a6 and NaDC-1 suggests the senso-regulatory molecular mechanism for oxalate/citrate homeostasis proposed in Figure 8. Slc26a6-NaDC-1 exists in a complex in which slc26a6 is active to excrete oxalate to the urine, in addition to the amount of oxalate that is already present in the filtrate. Under these conditions, high urine citrate is required to chelate Ca2+ and prevent its binding to oxalate. 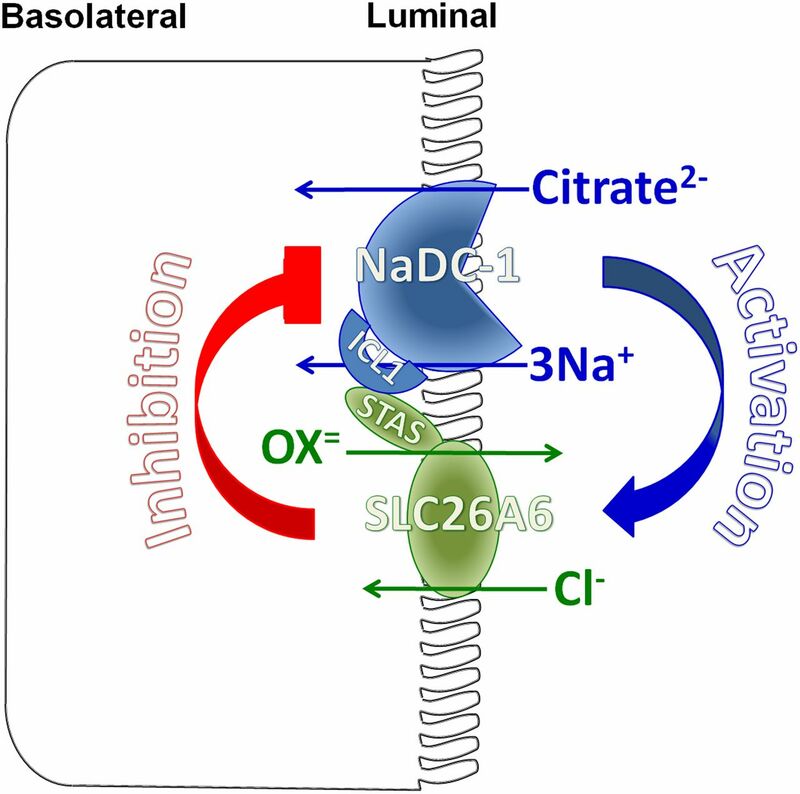 Inhibition of NaDC-1 by slc26a6 in the complex inhibits citrate absorption to increase luminal citrate, thus providing a safe haven to increase luminal oxalate. The physiologic relevance of the stimulation of slc26a6 activity by NaDC-1 is not known with certainty. However, it is possible that activation of slc26a6 depolarizes the plasma membrane due to Cl-out/Ox2-in exchange to further reduce the 3Na+/dicarboxylate transport by NaDC-1. In addition, NaDC-1 may be modulated by the other slc26a6 function of Cl-/2HCO3− exchanger. This can function as a negative feedback mechanism to limit citrate uptake by increasing the HCO3− concentration in the microenvironment around the NaDC-1/slc26a6 complex in the tubular lumen and dampening NaDC-1 activity by reduction of substrate availability33 and direct pH gating.34 The result is further reduction in citrate absorption to increase tubular citrate. The hypocitraturia in slc26a6−/− mice cannot be accounted for by dietary difference in acid load (equivalent urinary sulfate and ammonium excretion) or potassium status (equivalent plasma and urinary potassium), strongly supporting an intrinsic change in proximal tubule citrate reabsorption. A model for the molecular mechanism of slc26a6 and NaDC-1 reciprocal regulation in epithelia. The apical slc26a6 and NaDC-1 are present in a complex to allow their interaction. The interaction is mediated by the slc26a6 STAS domain and the NaDC-1 ICL1. When interacting, slc26a6 inhibits NaDC-1, while NaDC-1 activates slc26a6. The result is retention of citrate in the filtrate and perhaps other luminal fluids to chelate part of the Ca2+ to allow safe oxalate excretion. 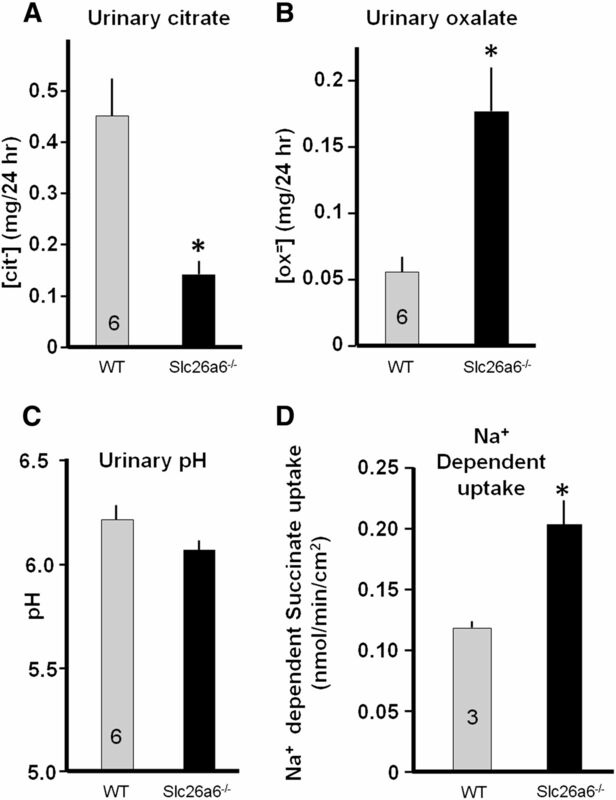 When minimal oxalate excretion is required, the interaction between slc26a6 and NaDC-1 relaxes to increase the activity of NaDC-1 and citrate absorption and salvage. Disruption of this regulation in disease states leads to Ca2+/oxalate stone formation. The slc26a6-NaDC-1 homeostatic system is likely to operate in several organs and to be disrupted in disease states. In the present studies we showed that deletion of slc26a6 increases intestinal NaDC-1 activity. Stones are very common in salivary glands2 and may result from malfunctioning or overwhelming of the slc26a6-NaDC-1 homeostatic system. Indeed, recent studies reported Ca2+-oxalate stones in salivary glands of several patients with CKD.35 Intriguingly, a recent study found a subgroup of stone formers with slight alkalinuria (pH >6) that showed suboptimal citraturic response to standard alkali therapy. The authors speculated on dysregulation of NaDC-1 as a possible reason for this condition.36 We show here that slc26a6−/− mice indeed have significantly reduced citrate and high oxalate. Maintenance of inhibition of NaDC-1 by slc26a6 may be an important homeostatic mechanism that is deranged in stone formers. It will be of interest to explore the functioning and the significance of the slc26a6-NaDC-1 homeostatic system in multiple organs. All of the work on mice was conducted following the Guide for the Care and Use of Laboratory Animals by the National Institutes of Health and was approved by the Institutional Animal Care and Use Committee at the University of Texas Southwestern Medical Center and the National Institute of Craniofacial and Dental Research, National Institutes of Health (NIH). Wild-type and slc26a6−/− mice were individually housed in MMC100 metabolic cages (Hatteras Instruments Inc.). All mice were on rodent diet NIH 31 and tap water during the experiments. After acclimatization, 24-hour urine samples were collected over the course of 3 consecutive days. The collected samples were analyzed for urine electrolytes, and the results are summarized in Supplemental Table 1. For all experiments, mice were euthanized with CO2. The two kidneys were excised into PBS (pH, 7.4), and the capsules were removed by pinching. Fresh kidneys were embedded in 4% agarose blocks in PBS and polymerized at room temperature. The agarose-kidney block was cooled and 1-mm-thick slices were cut using Vibratome (Electron Microscopy Sciences model OTS-3000) (insert in Supplemental Figure 6A). The kidney slices were separated from the agarose, and the cortical section was cut out and placed in ice chilled PBS. Photo images on top of a graded paper used as scale were taken for determining the kidney cortical area (Supplemental Figure 6A). The mid-jejuna were removed, and the tissue was transferred immediately into ice-chilled PBS (pH, 7.4), cut along the mesenteric border, cleaned, and cut to small pieces of about 5×5 mm. The tissues were placed in six-well dishes fully stretched with 27-gauge needles and photo images on top of a graded paper used as scale were taken for determining the epithelium area (Supplemental Figure 6B). Image analysis of all tissues was performed with ImageJ v1.43u software (NIH). The tissues were then incubated in a water bath and agitated (100 oscillations/min) for 5 minutes at 37°C in 24-well dishes containing 500 µl of incubation solution (in mM): 5 KCl, 10 HEPES, 10 glucose, 140 NaCl or NMDG-Cl, pH of 7.4. Subsequently, the tissues were transferred to wells containing uptake solution supplemented with 0.1 mM (kidney) or 0.5 mM (intestine) succinic acid and 1 µCi 14C-succinic acid (ViTrax Inc.) per 0.12 µmol (kidney) or 0.7 µmol (intestine) of cold succinate. Tissues were incubated by agitation for an additional 2 minutes (kidney) or 5 minutes (intestine) at 37°C. The samples were then washed in ice-chilled PBS for 2 minutes and transferred into scintillation veils containing 0.5 ml NaOH (1 M) and incubated for 1 hour at room temperature with intermittent agitation to solubilize the tissues. After addition of 0.5 ml of HCl (1 M), radioactivity was determined by liquid scintillation counting using a Beckman sc60001C counter (Beckman Instruments). Osmolarity of all solutions was adjusted to 300 mOsm with the major salt. Oocytes were obtained by partial ovariectomy of female Xenopus laevis (Xenopus Express, Beverly Hills, FL), as previously described.37 Briefly, animals were anesthetized and follicle cells were removed in OR-2 calcium-free medium. Defolliculated oocytes were washed with OR-2 calcium-free medium. Healthy oocytes in stages V to VI were collected under a microscope and maintained at 18°C overnight in ND96 solution. Oocytes were injected with cRNA using a Nanoliter 2000 injector (World Precision Instruments Inc., Sarasota, FL). Oocytes were incubated at 18°C in ND96 solution with pyruvate and antibiotics and were tested 48–96 hours after cRNA injection. Current, voltage, pHi, and [Cl−]i recordings were performed with two-electrode voltage clamp as described elsewhere.6 In brief, current was recorded using Warner Instrument Corp. amplifier model OC-725C and digitized via an A/D converter (Digidata 1322A; Axon Instruments Inc.). 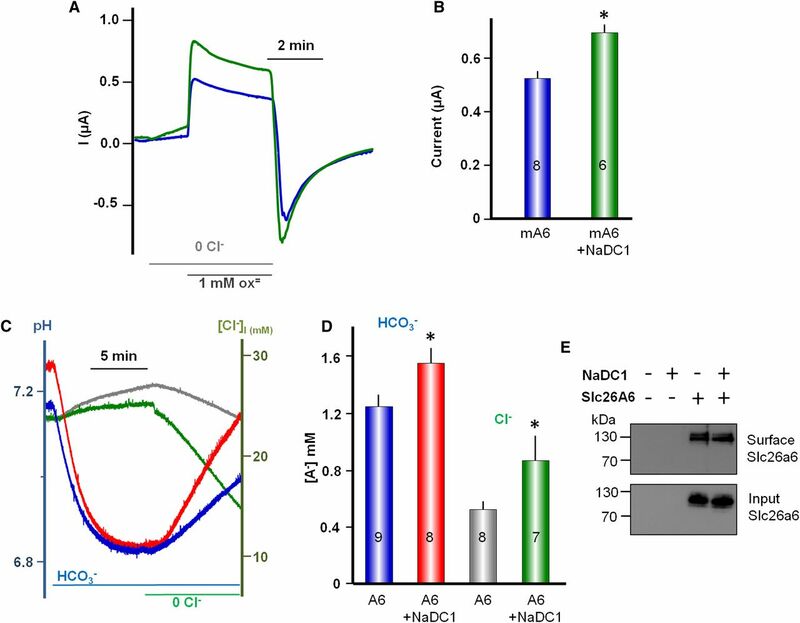 Slc26a6-dependent currents were recorded at a holding membrane potential of 0 mV and NaDC-1–dependent currents at a membrane potential of −30 mV. Data were analyzed using the Clampex 8.1 system (Axon Instruments Inc.). The electrode tips were filled with 0.5 μl of H+ or Cl− exchanger resin, hydrogen ionophore I, cocktail B (Sigma-Aldrich), and Cl−-sensitive liquid ion exchanger 477913 (Corning), respectively, and then backfilled with a 3 M KCl solution. During measurements, two channels were used for ion-sensitive measurement and another was used to record or control the membrane potential. The pH and Cl− signals were extracted by subtracting the membrane potential signal from the ion-selective electrodes signal using Origin software (version 8.1; OriginLab). For simultaneous measurement of pHi, and [Cl−]i in oocytes, a three-electrode method was used as described previously.6 The following solutions were used as indicated in the figures: Standard HEPES-buffered ND96 oocyte regular medium containing (in mM) 96 NaCl, 2 KCl, 1.8 CaCl2, 1 MgCl2, and 5 HEPES, pH of 7.5. Cl− free solutions for oocytes were prepared by replacing Cl− with gluconate and MgCl2 with MgSO4. HCO3−-containing solutions were prepared by replacing 25 mM NaCl or Na+-gluconate with 25 mM NaHCO3 and were continually gassed with 5% CO2/95% O2. Na-Oxalate and Na-succinate were added to the solutions as indicated in the figures. Surface expression was analyzed by biotinylation. Because oocytes transport biotin, biotinylation assays are not reliable in oocytes. Thus, biotinylation was performed using HEK cells. HEK cells expressing slc26a6 and/or NaDC-1 were incubated with 0.5 mg/ml EZ-LINK Sulfo-NHS-LC-biotin (Thermo Scientific) for 30 minutes on ice, quenched by incubation with 50 mM glycine for 10 min and washed twice with PBS. Cells were collected by scraping and centrifugation for 20 minutes. Lysates were prepared by incubating the cells in ice-cold lysis buffer containing PBS, 10 mM Na-pyrophosphate, 50 mM NaF, 1 mM Na-orthovanadate, 1% Triton X-100, and protease inhibitors cocktail. Total protein concentration was determined by the Laurie method. Biotinylated proteins were then isolated with avidin beads by overnight incubation with the lysates and recovered by heating in SDS sample buffer at 37°C for 30 minutes. Similar lysis buffer was used for co-immunoprecipitation, extracts were incubated O.N. with the indicated antibodies, and complexes were collected with protein A or G Sepharose beads by incubation for 4 hours at 4°C. Beads were collected by centrifugation and washed three times with lysis buffer; proteins were recovered by heating in SDS sample buffer at 37°C for 30 minutes. The samples were subjected to SDS-PAGE and subsequently transferred to polyvinylidene difluoride membranes. All results are given as mean ± SEM, and significance was analyzed by t test or ANOVA using Origin software 8.1. We thank Dr. Danielle Springer, Robin Schwartzbeck, and the staff of the National Heart, Lung, and Blood Institute phenotyping core at the National Institutes of Health for providing metabolic cages and assistance in mice urine collection. This work was supported by Intramural Research Program of the NIH, National Institute of Craniofacial and Dental Research grant ZIA-DE000735. E.O. and N.S. contributed equally to this work. This article contains supplemental material online at http://jasn.asnjournals.org/lookup/suppl/doi:10.1681/ASN.2013010080/-/DCSupplemental.